Sometimes, we start our garden design from a patch of dirt. Sometimes, we just tidy up existing gardens. We update the irrigation, add fresh plants and mulch, and maybe lighting. This garden got a makeover right before the holidays and our happy client sent us the email below. We’ll update with Spring bloom photos soon. “I’m sitting in my little office which looks out on the garden, and it is just so beautiful I had to write. The sights and smells out there are divine, and yesterday we were visited by a mob of butterflies that I think are Painted Ladies! I put in some Mister Lincoln roses, who seem really happy here, and I’ve pruned the guava “tree” down to large-bush size, which will suit the garden better. The Anna apples look wonderful and both the Redbud and Pomegranate seem to be thriving. I will send pix around Eastertime when all is in bloom. Meanwhile, thanks again for a lovely job! A perfect pair, designed to match the home’s foundation, planted with Australian Willows. A larger rain garden, full here. Water was absorbed by the next morning. All three gardens, above, harvest water from the roof gutters. We connected downspouts to the swales via underground drainpipes. Now the water is dispersed and absorbed. Extra water will filter through the soil into aquifers. If you still have a lawn and want it evergreen, but using as little water as possible, just add clover. Hopefully, you’re already maintaining your lawn organically (no chemical fertilizers or herbicides or weed&feed) and grasscycling. If you look closely, you will probably find some clover there already, probably in the really green parts. If not, you can overseed any part of your lawn that is looking bare/brown/patchy with Dutch White Clover seed. You can also top with some compost for good measure, but no need to go crazy with stinky manure. Clovers, like legumes, (and with help from their little friends, in the soil) pull nitrogen out of the air and bring it into the soil, where they share it with the grass. Free, natural, bio-available fertilizer. That’s why the grass growing with them is super healthy. You can order seed online (it’s cheaper than fertilizer! ), and just scatter some around your yard, especially where it’s looking unhappy. Water it regularly for a week or so and watch your grass turn super (lucky) green. Read more about this in the “Estate Lawn” section of the Beverly Hills Garden Handbook. 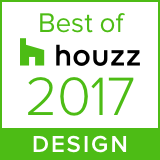 Thanks, Houzz readers, for voting us one of the Best Of Houzz 2017! We helped G3 (Green Gardens Group) write this handbook for the San Diego SLP. Click on the link below for the full PDF. The Sustainable Landscapes Program partners have produced a comprehensive, 71-page color guide entitled San Diego Sustainable Landscape Guidelines which details best practices and recommendations for a watershed approach to landscaping.